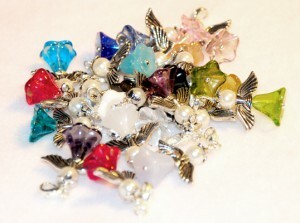 I create and sell angels to help fight cancer in the memory of my grandmother who passed away a few years ago. The entire profit made from the sold angels will be donated to Cancerfonden, a cancer foundation here in Sweden. Each angel will give me 40 SEK to donate, that means I will have to create 1 000 angels to reach my goal. You can see the progress towards my 40 000 SEK collection right below. If you want to contribute, just visit my etsy shop and do something good today. An angel is the perfect gift for yourself or a loved one, everyone appreciates a gift that matters. Keep in mind that even if you are lucky enough not to get cancer, you are (or will) most likely be affected by it somehow. I really wish you won’t be. With my donation I hope that less people have to experience the lost of a loved one, that is my only reason.